28.08.2012 On September 22nd-23rd the final round in the Auto GP World Series 2012 is held in Sonoma, California, USA. Sonoma is located close to San Francisco and Napa, and it is considered the birthplace of wine-making in California. The area is filled with vineyards, and has a very pleasing climate, which makes Sonoma a popular destination for tourism. The Sonoma Raceway is located in the Southern part of the Sonoma County, and is known for its tricky corners and “rollercoaster-ish” uphill and downhill racing circuit. The Sonoma Raceway is today known as one of only five circuits where NASCAR doesn’t drive on oval tracks. As its motto says: “think outside the oval”. The circuit has had many names. Traditionally it is known as Sears Point Raceway, named after a local ranch called Sears Point Ranch. In modern days, the circuit has since 2005 been called Infineon Raceway, after Infineon bought the naming rights of the circuit. Today, since May, their naming rights has expired, and the circuit is now called Sonoma Raceway. This year, there has been built a couple of changes on the circuit. Especially the IndyCar circuit has changed in a few areas, where I will be racing on September 22nd-23rd. 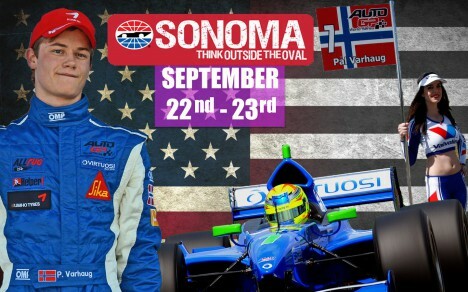 This is the first time Auto GP will be launched on Sonoma, and the first time it is launched in USA. Auto GP will actually considered to be the only high-power single-seater series to have ever raced at the Sonoma Raceway apart from IndyCar. For my part, it will be exciting to see the difference in lap times from an Auto GP car, and an IndyCar. I am also looking forward to race at this circuit as it seems like a pretty cool and exiting circuit. And to see the Sonoma area, and San Francisco is something I am also looking forward to. I have never been in the United States before, and I have always wanted to go to California. I am really looking forward to it. I will give full throttle in the final race weekend in the 2012 Auto GP World Series.